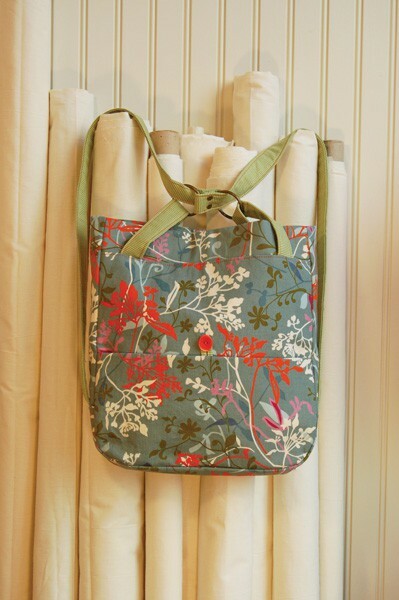 This versatile bag can be worn as a backpack, shoulder bag, or tote and is suitable as a second project for new sewers. 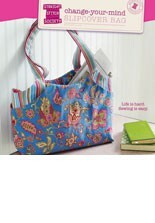 Fully lined interior includes zippered pocket and divided patch pocket for pencils, cell phone, or other small items. Share your photos on Instagram with the hashtags #dayintheparkbackpack and #lieslandco. Medium- to lightweight fabrics such as upholstery fabric, cotton home decorating fabric, quilting cottons, linen, or wool. Note: A walking foot is strongly recommended, due to the number of fabric layers. 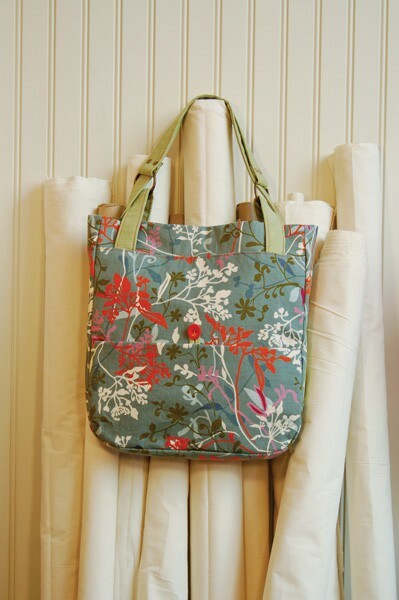 The body of the bag measures 13.5" tall (without the straps), 12" wide, and 2" deep. This bag has a great many pieces to cut out and is pretty heavy going at the sewing machine - canvas interlining makes for some extremely thick seams that my mid-range domestic machine struggled to cope with (my outer fabric was also heavy, which made this worse). The resulting bag is not as practical as I'd hoped - when carried as a backpack the top edge collapses, despite all the interlining etc; when carried as a tote you can't easily access your stuff - with most totes you can just let one shoulder strap down to reach in a grab things, but with this design you have to take the whole bag off your shoulder to get into it. The outer buttoned pocket isn't much use for anyone who travels by public transport - much too inviting to pickpockets (I added a zip to it). The bag as drafted is very thin, not big enough to hold a water bottle, but you can remedy this by increasing the width of the side panels. This bag took much more time and effort than expected and didn't give quite the results I'd hoped for. The instructions are clear and all the pieces fitted together correctly. The convertible strap design is unique, but there are simpler, quicker patterns around that produce more practical bags. I really enjoyed making this bag. Like every pattern from Liesel and Co., the directions were extremely easy to follow. The bag itself is very cute and functional. I will be making several more of these to give as Christmas presents. I have made this bag at least ten times to give to friends and family. It's always a big hit. I love being able to select a fabric that is special to the recipient. I've used fabric with birds, flowers, trees, bicycles, even RVs! It's fun to mix and match fabrics for the lining and pockets. The instructions are well written and the bag goes together very nicely. I couldn't find my original pattern so I recently bought a digital copy. Love this pattern! 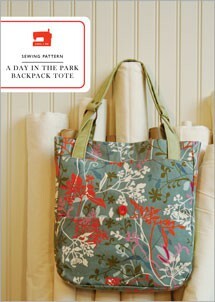 I have made this bag many, many times since first buying the original paper pattern at Purl Soho several years ago. 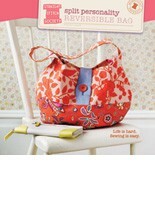 It is perfect whether it's made with upholstery fabric, decor weight, or quilting cotton. The size and shape work for everyone--I do make longer handles for myself because I'm tall. Whenever I carry it, people ask about it, and so I have made several as gifts, and have even taught a class for it, with many requests to repeat it for those who missed it. It truly is a classic that will never go out of style. I made this bag as a present for my mother in law. She exclusively rides a bike as daily transportation, so this bag was perfect for her. Sewing this bag is not as difficult as it may seem, you will need some time, but it is fun to sew and the result is well worth the time invested. I used suede immitation and made it sturdy by using canvas and interfacing as recommended. I used a jeans needle 110... be sure to use a new one, it will work better. I found the other materials in a fabric store near our apartment, so I cannot say that it was difficult to find them. I must confess I did need some help for inserting the ribets because you do need a little bit of muscle... but other than that everything comes out smoothly. Just be sure to have enough time to do this project and I promise 100 % it will be fun to make. I have made this bag twice now, once as a gift and once for myself. The most difficult part is cutting all the pieces out, but once that job is done, it comes together quickly. It has become my go-to bag and I love the convertible straps--items stay very securely inside when worn as a backpack. 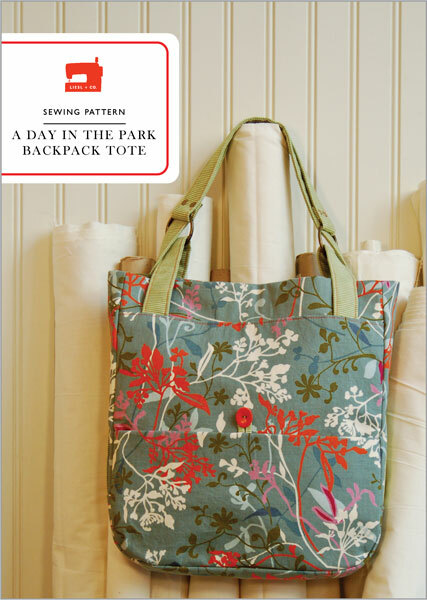 Discussion on the digital a day in the park backpack tote sewing pattern from the Oliver + S Discussion Forums. Find and share more photos on Instagram using the hashtags #dayintheparkbackpack and #lieslandco.